This DVD gives a real insight into the setup, use and maintenance of a tool that sits at the centre of many woodworkers' workshops - both amateur and professional. From the beginning, Mehler shows the simple mechanisms that make up the component assemblies that make the saw blade move and tilt. What is great for newcomers to the tool is that Mehler assembles the tool as he explains how each part works and shows how to set it up. The table saw has something of a fearsome reputation when it comes to safety as, if incorrectly set up, this tool is easily capable of kicking back large and heavy pieces of wood right at the user or, worse, removing fingers. Therefore it is a tool which needs to be set up with real attention to detail. Perhaps because this lesson was filmed in 1992, long before the patented Saw Stop came on the market, Mehler very thoroughly covers all of the critical safety aspects of personal protection equipment, blade and fence set-up and, crucially, which operations the saw can and cannot safely complete. Mehler shows how to handle large sheet goods and why it is essential to have outfeed - and ideally infeed - support. More than that, he shows how to cut joints quickly and effectively using homemade jigs and fixtures as add-ons to the saw. Despite the sound and picture quality beginning to show their age - it was originally shot on video - the content is the key to the value of this production. 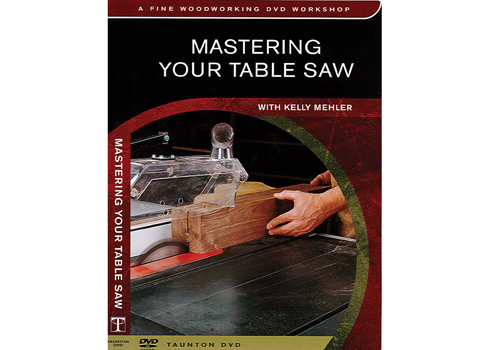 If you are already a user of the table saw, this DVD will show you how to get the most accurate set up possible, but for beginners this production is a clear, concise and well-explained introduction.